We are proud to be the Best Carpet Cleaners in Lebanon and Mount Juliet, and we’ve been serving customers in Wilson County for almost 20 years. Our company uses a cleaning solution that does not saturate into carpeting fibers. This patented formula is biodegradable and non-toxic – so it is safe for your kids, pets and houseguests. Best of all, it dries in 30 minutes! And with no water saturation, our process completely eliminates the problem of mold and mildew. Fantastic results and reliable service at reasonable prices – from a carpet cleaning company you can count on. Our pricing is clear and straightforward, and there are never any “hidden charges”. You will know in advance exactly what we charge. Our company and services are licensed and insured, and we’ve been rated A+ by the Better Business Bureau (see our BBB rating here). SATISFACTION GUARANTEED: We also offer an unconditional guarantee. If you are not satisfied after one room, we will leave at no charge or hassle. Period. Ready to get your rugs, carpets & upholstery looking like new again? Contact us for a free estimate & get an exact quote in less than a minute. 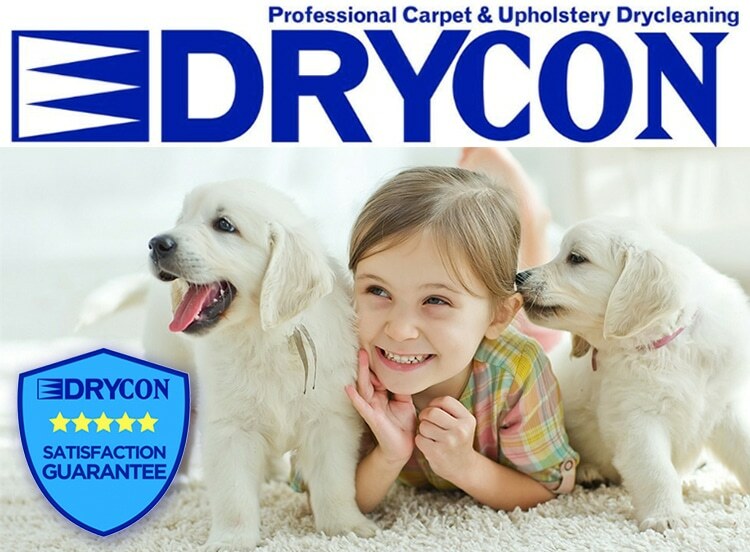 Why clean your Upholstery, Rugs & Carpet with Drycon? Using a patented cleaning solution that is safe and non-toxic, we spray a mist over the carpet that reacts with dirt and soil to break it away from the carpet fibers. Using the buffer system and absorbent pad, we lift the dirt from the carpet. Unlike steam cleaners that use a lot of water and causes the dirt to be pushed down into the pad and allows for resurfacing of stains, Drycon uses less water allowing for fast dry time and no resurfacing of stains. – safe for children and pets! Enzyme in the solution neutralizes the smell and unwanted odor of pet urine that is embedded in the carpet. Makes carpeting and floor coverings more resilient against stains and soiling. Using our patented solution, we use the buffer to pull the dirt out of the rug without running the colors of the rug together. Our process is also safe for the delicate fibers of oriental rugs and area rugs. We first apply a commercial grade cleaner to the hardwood, that when dries reacts with the polyurethane. Using the buffer system and a polishing pad, we buff the hardwood leaving it with a beautiful shine that does not scuff the hardwood. We spray the upholstery and use a handheld buffer system to pull the dirt out of the upholstery. This does not cause any shrinkage of the material or fading of the color. Typically used for home furniture such a chairs, sofas, loveseats, and couches. Our patented cleaning solution in a easy to use spray bottle. Use a towel or soft hand brush, work well into stained area, and wipe with dry towel. Repeat if necessary. Safe to use on carpet, dry upholstery, table cloths, and draperies. If your hotel, restaurant or business has dirty carpets or rugs, contact us! Our quick drying time means we can get the floors of your business looking great without any downtime. Our reliable commercial carpet cleaners will get the job done fast and save you money at the same time. Welcome to Drycon, owned by Rob Metzler, a lifetime resident of Wilson County. Business Hours are Monday-Saturday 8AM- 6PM, but call 615-444-6162 anytime for a quote or to schedule a professional cleaning. Steam cleaning frequently uses high pressure that forces water down through the carpet backing into the pad. This leads to high volumes of water that can be left behind trapping soapy, dirt-attracting residue deeply embedded in your carpet, creating the risk of reappearing spots and a potential breeding ground for mold and bacteria. Looking for our other locations? Metro Nashville, Hendersonville & Gallatin, and now Dickson County. For East Tennessee, we highly recommend Drycon of Knoxville & Drycon Sevierville.